I……………. don’t have any pictures for this show. 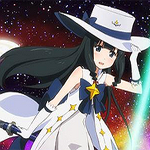 I’ve got some predictions for the Houkago no Plieades anime, including air date, episode count and episode length. LENGTH OF EACH EPISODE: 24 mins. PREDICTION ONE: The show will be more than it seems… what I mean by this is that it could possibly pull a Madoka. Maybe around episode 6. But looking at the PV, I don’t think it’ll ever pull a Madoka. I feel like it’ll be more traditional. PREDICTION TWO: Ganiax will remake the four web episodes into one episode. Since this show was originally four ONAs, I can imagine them remaking them all into one huge episode. If they don’t I will be shocked. PREDICTION THREE: THERE WILL BE ROMANCE. Not sure if it will be yuri romance or straight romance, but THERE WILL BE ROMANCE. I can feel it in my skin. This anime is probably going to a Seinen, by the way. PLEASE WATCH THE ONAs BEFORE THE ANIME COMES OUT. I cannot stress this enough. The four ONAs aren’t very long. Go and watch them before April hits.